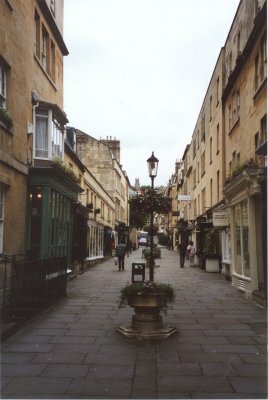 Within the British Isles, I find that it is hard to beat Bath for character and charm ... and shops with a difference. 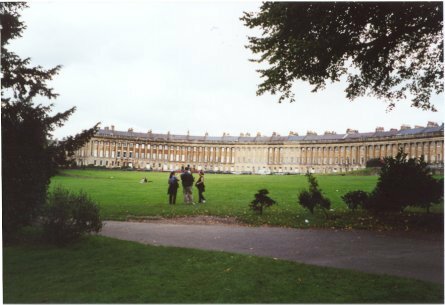 The picture to the left, of Royal Crescent, shows probably the most recognizable part of the city: frequently a scene in period films and classic TV dramas. The cobbled street outside is no longer a through-road and the Bath tour busses are no longer permitted to drive down this street - although the can stop in Royal Victoria Park just below for passengers to get a good viewpoint. In order to prevent the historical appearance of Royal Crescent from being defaced, the council are very strict about what can and cannot be done. Slap-bang in the centre of the crescent is a fine hotel, but no board is allowed to announce it: just the doorman makes it look different. How English! But take a closer look and you will find one house that defies the rules by having a yellow rather than a white front door. The owner had to go to court in order to establish her right to paint the door what colour she chose and, having won, it is now written into the deeds that the door shall be yellow! I also like the passageway Margarets Buildings nearby (off Brock Street which leads to Royal Crescent) - shown in the picture to the right. You can take an easy downhill walk from the adjoining The Circus (another architectural triumph in the complete round) - down Gay Street - seriously, so watch your walk - to Queen Square; how appropriate. Slap-bang in the centre of the crescent is a fine hotel, but no board is allowed to announce it: just the doorman makes it look different. How English! H and I are always going back to Bath. It's almost a ritual. Even if we didn't have family links to a beautiful village near there which I won't mention - it doesn't need more visitors, and there are numerous beautiful villages for you to stumble on without my assistance - we would still keep going back to Bath. There's just something about it which draws you back. A city of white stone, nestling in the crook of hills, famous for its historic spa status, first promoted by the Romans, and later by the Victorians, it has been a seat of elegance for centuries. It has suffered over the years - from war and flood damage - but you would not know this today. 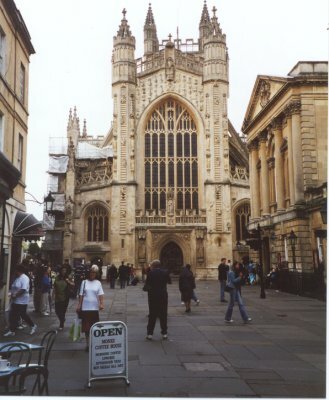 Bath Cathedral dominates the centre of the city, with the Roman Baths in its shadow. Visit the baths - nothing personal intended - and imagine the Romans coming here to get scrubbed-up before a night of decandence. Visit the shops: which vary from modern to unusual. This is one place where the chain stores have made the least impact: although some can be found, they in no way have driven out variety. Going north from the Abbey Church Yard - where the best of the street entertainers are to be found - follow the narrow passage-ways, including Union Passage, for some atmosphere and interesting shops. Take a City Tour on one of the red or white open-topped double-decker buses; yes, you can't get away from them in England. Visit the Assembly Rooms to see the costumes that were once worn in the city; save with a combined ticket to the Roman Baths if both interest you. In the building housing the Baths you can also see an ancient 'Bath Chair', a small enclosed, single-seater carriage where dignified gentry would sit to be towed by a peasant. (No, you can't do that now, or take pictures of family and friends sitting in it.) You could also "taste the waters" from the spa, said to promote health; my personal recommendation, however, is to give that one a miss! The River Avon flows through the centre of Bath. 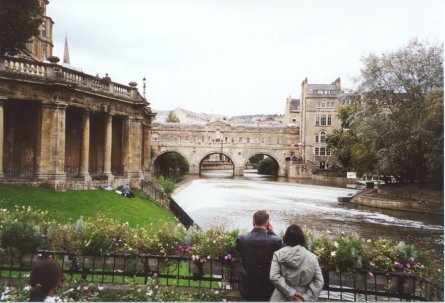 The most picturesque spot is just below Pulteney Bridge, as seen in this picture taken from the Parade Gardens. What mysteries abound around this bridge! Like how the passenger boats upriver of the cascade avoid shooting these miniature rapids, why they built right across the bridge so you can't see over at all unless you have a cup-of-tea in a very thin café, and how to find your way down from the bridge to the east bank (via steps hidden discretely behind railings and between buildings). Take a stroll through one of the many green patches that offer such pleasant relief on a hot summer's day. And if you like architecture, I strongly suggest that you buy one of the delightful 3-D type maps (eg at the Tourist office) and use this to navigate your way to the upper-reaches of the city (ie higher), to confirm the fact that there are two other crescent-shaped 'Parades' to be found if you have the feet, lungs. From Royal Crescent, take Brock Street to The Circus, go straight across and along Bennett Street; ascend Lansdown Road taking a peak at the uncompleted Camden Crescent to the right - landslips prevented its completion - then retrace your steps and follow Lansdown Road higher and higher to Lansdown Place East on the left, many puffs higher. Follow this street into the highest crescent - Lansdown Crescent - for a splendid view. As your reward for all this effort, go to the far end of the crescent (Lansdown Place West), go down the small All Saints Road, bear left at the house and follow the passage. 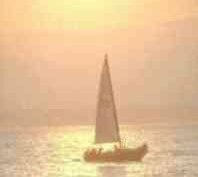 Then just go downhill bearing generally right. So long as you don't enter the park and keep going downhill you should get back to Marlborough Buildings and hence Royal Crescent again. Sydney Gardens are a delight, and from them you can reach the canal. 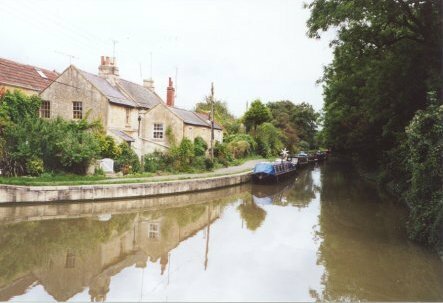 Walk the towpath to Avoncliffe and see its causeway, if you have very good legs, or hire a bicycle and terrorize the walkers - and enjoy some of England's most beautiful and unspoiled countryside while so doing. To visit Bath and miss the delightfully rural countryside that surrounds it would be a sin! Do it all, and go back in time in Bath. You'll always remember it. What a contrast to London! BATH ELEGANCE Set in a delightful garden, Apsley House is a fine Georgian residence built by the Duke of Wellington. Come enjoy its elegance! "The Cotswolds" is a phrase which describes an area of hills which contain a clutch of picture-postcard-perfect villages. Thatched cottages, village ponds and streams compete for chocolate box and calendar pictures - and you, as a tourist, will need either a good stock of film or great will-power to restrain your clicking-finger! Beauty abounds, therefore so does the tourist: but there are enough villages to go round, and the area is well used to coping. Indeed, it depends on it. So visit! If you really want to imagine what ageless tranquil beauty would be like without you, this is the region to go! But make sure you've got a car: although you don't have to travel many miles, there are a lot of places to cover. You need a car but it can, sometimes, be a liability. The narrow lanes and streets of many of the places you will wish to visit were not designed with modern transport in mind, and even parking can present problems at times. For example, the pub we last stayed at in Bournton-on-the-Water did have a car park at the rear, such as it was - space for about three vehicles, all liable to get pinned it - and we found it better and safer to find a street to park in a little way away. We pre-booked this pub which offered rooms at a modest price: the result was some considerable room for improvement in bedroom standards, but little room for improvement in the value-for-money when it came to the food! There were plenty of other pubs and hotels nearby that offered every other permutation, including those with luxury facilities and those with production-line food. As always, you pay your money and take your choice! It might be wise to plump for bed-and-breakfast, so leaving your options wide open for those other 'special' meals. There are too many towns and villages to list, but here are a few especially worthy of mention: Stow-on-the-Wold, Bournton-on-Water, Broadway, Upper-Slaughter, Lower-Slaughter, etc, etc. Last time we were there for a long weekend it rained practically all the time. Yet, despite the weather being so cruel, the beauty of the area still shone through, and with such a rich variety of mellow-stone pubs and tea rooms to choose from, and good company, this gave extra excuse to explore their delights. Your visit will be a time of wandering down picturesque streets and lanes, browsing through interesting gift-shops, admiring yellow-stone cottages and churches, watching children paddling in free-flowing, crystal-clear streams, tea-drinking at rocking oaken tables on uneven-floored tea rooms, and taking too many photographs. It will not be a time of visiting large stores or theatre-going: here, the pleasures are more sedate and basic. (Our pub was alive, in the evening, with people in costume dress, there to enact some battle in a field nearby on the following day!) Come here to recharge your batteries! With such a rich heritage of beauty on the doorstep, it is not surprising that there are quite a lot of places selling pictures and prints by local artists - a nice memento if you don't mind carrying large parcels back home. Then there are some fantastic antique opportunities too. English towns and cities always have their fair share of antique shops, although much of their stock might be regarded as junk by some of the locals: usually you do have to be selective if you are seeking value for money. In the Cotswolds, however, you tend to find some rarities: beautiful antiques, very often physically large - and with equally large price tags. If you just want something that "looks antique" then shopping elsewhere is probably advisable; if you can afford something that has true character and really is antique, then this could well be the place to shop - although I would be castigated for saying so by some of the population who hate to see such heritage leaving our shores. (So do I, actually, but I am here to help! Relatively speaking, it can be expensive staying in the Cotswolds: but pubs offer good value, and usually include that important relevant ingredient: the atmosphere of a bygone age. So if you go to England to discover and savour this, then do spend two or three days exploring this delightful area: preferably when the sun is due to shine! Edinburgh is a nice place to visit. I'm sure of that because I made a strong mental note to return when I was there on business. Unfortunately I've not got round to going back yet, but Princes Street and the dominance of Edinburgh Castle on the hill are imprinted on my mind. There is an air of elegance and style about the city. It is also noted as a festival city: they take any opportunity to be festive. So, I can't say much - except that it leaves a lasting impression, even when just passing through! Oh yes. I also remember it because I heard on the news the day after I got home that there had been a serious fire in the hotel in which I stayed the night. I feel I must add that I don't even smoke! If you enjoyed reading the above article then you will probably also enjoy Irish Republic by Ed, and Oslo, also in Europe, and our latest articles covering the Orinoco Delta, La Mata, Marbella and Beijing.